Last Sunday I saw Abe Lincoln and Uncle Tom in the White House in the Guthrie Studio Theater, an imagined conversation between the two men, one real and one imagined, on the night before the historic signing of the Emancipation Proclamation. 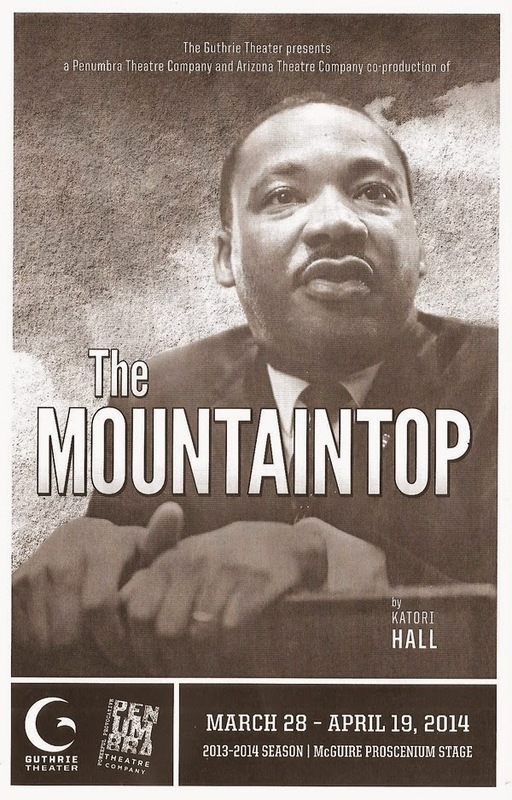 This Sunday I attended Penumbra's production of The Mountaintop in the Proscenium Theater, another imagined conversation between a real and imagined person on the eve of another important event in the history of Civil Rights. This time that conversation is between Martin Luther King, Jr. and a mysterious woman. It shows us a different side of this great and iconic man, one that's much more human. I found it to be funny, tragic, inspiring, and really beautiful. 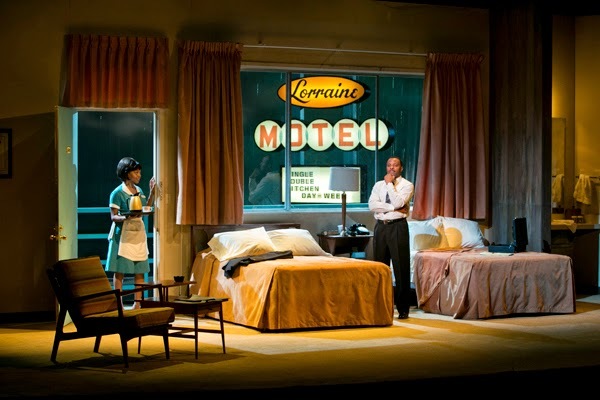 As the audience is still filing into the rich red of the Guthrie Proscenium, Martin Luther King, Jr., in the form of the magnificent James T. Alfred, paces around his onstage hotel room, as we get a glimpse into the private time of this very public man. After several minutes, the lights go down and the play begins. Martin calls room service for coffee, which is delivered by the spunky hotel employee Camae (the delightful Erika LaVonn) on her first day on the job. The two embark on a frank and informal conversation, about Civil Rights as well as more mundane topics like cigarettes and style choices. It's soon revealed that Camae is not exactly who she says she is, and the play veers into the fantastical world of the imagination, although still grounded in reality. This play shows us that great leaders are not perfect. They have fears, flaws, and stinky feet, just like the rest of us. But yet they persevere and try to improve the world we live in, despite the personal costs. This two-person cast, directed by Lou Bellamy, is absolutely captivating. James T. Alfred brings so much humanity and vulnerability to MLK, and he also portrays the commanding dignity of the preacher. Erika LaVonn is a true delight - charming, funny, spirited, and lively. The two of them create a wonderful space in which this inspiring story unfolds. One theme of the play is that Civil Rights and justice for all is a relay race, and Martin Luther King, Jr. ran just one leg of the race, albeit a pivotal one. This play makes me feel like all of us can and should take up the baton passed to us by MLK and continue his work and the work of so many others. Go see The Mountaintop, playing through April 19 at the Guthrie Theater, for an inspiring new look into the life of this legendary leader. *Martin Luther King's final speech.